There is so much beauty emerging in the spring landscape this time of year. Trees are slowly greening up, going through stages of red and emerald before settling on their summer colors. Lilacs are out after Mother’s day, and gardens are on full display. In the woods, things change quickly. 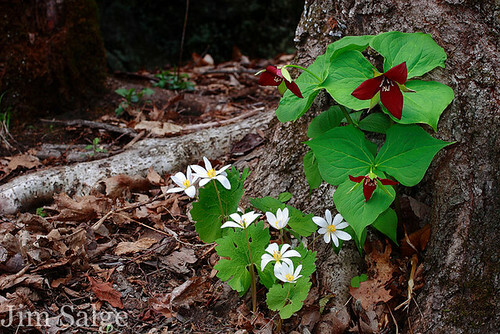 By this point, all signs of the earliest wildflowers like the spring beauties and hepatica have disappeared. And the larger, showy flowers have taken over the forest floor. 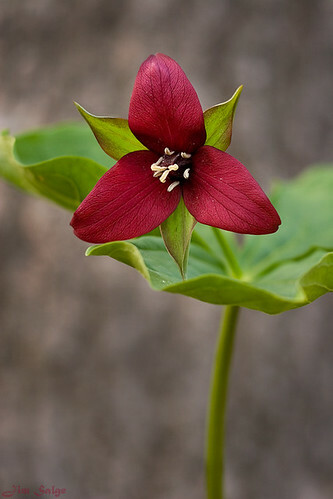 For each of the past three years I’ve been walking past some trillium leaves on a local river bank that never seemed to bloom. I figured them too young, or in poor soil or any number of reasons why a group of plants wouldn’t flower. 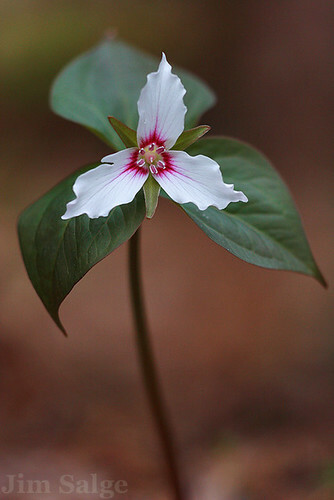 Something caught my eye this past week though, and I peered underneath to find a species I’d never seen before…the nodding trillium. I’ve known of the existence of these flowers…I just didn’t know that their range extended up as far as southern New Hampshire. With a new wildflower opportunity, I spend a few hours trying to compose this difficult flower. The blooms liked to hide under the large leaves, and the depth of field also provided challenge. I was more than pleased with the results though. 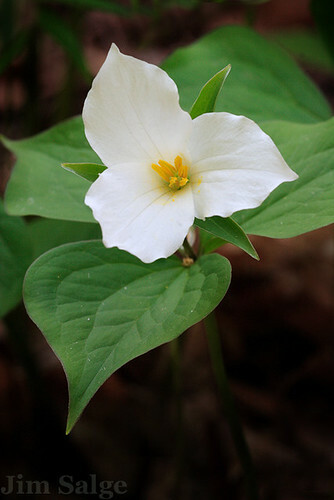 So now I’m glad to report that we have four local trillium species in New Hampshire. They don’t all bloom at the same time, and they all don’t like the same habitat. Painted ones seem to like acid soils, large whites, more alkaline. Wake Robins bloom earliest, Nodding, the latest. All provide unique challenges to shoot, and all are great companions on any spring walk in the woods. Hope you find a few! Wow, things change quickly in spring! A bit over a week ago, I was leading a backpacking trip to Lonesome Lake with nineteen high school students, and it snowed on us for three straight days. I then embarked upon a belated honeymoon to Costa Rica (leaving the good camera behind for the trip), and have returned to see the woodland spring ephemeral wildflowers racing to flower before the canopy closes in. To take advantage of the now nice New Hampshire weather, and new growth, I went to Rumney yesterday to photograph some of my favorite flowers on an accessible rich slope. On the way, the grass was green, the forsythia was in bloom and the lilacs in bud, and the warblers were singing loudly. The blackflies are back too…but we’ll focus on positives. 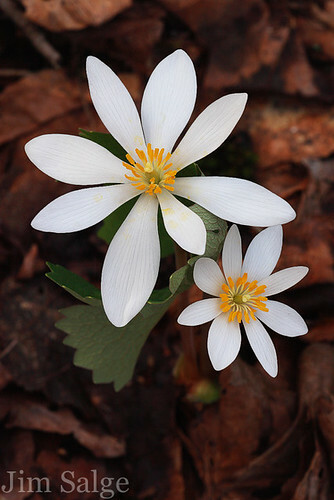 Not only was the bloodroot out…it was almost past, and many of the second wave flowers were blooming as well. 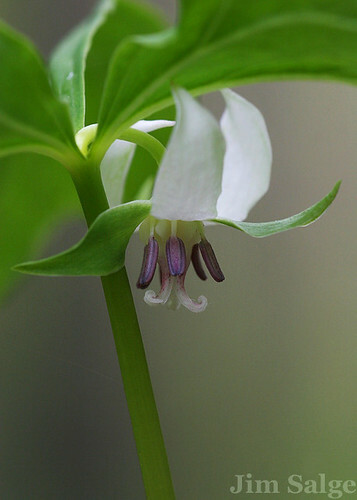 We found trout lilies, dutchman breeches, saxifrage, toothwort, as well as many emerging and flowering wake robin trillium. Most of these flowers I have no problem finding in other locations, but bloodroot I have a difficult time finding, so it was the focus of the day. 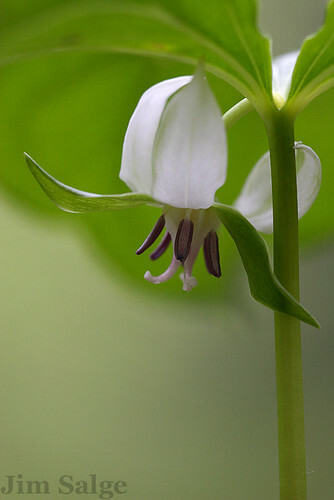 It’s a rather large flower by early woodland standards…ranging one to two inches across. The plant has one symmetrical large leaf, which encloses the flower until it is ready to bloom…which only occurs in direct sunlight. Over the next week, I’ll be stopping at a few favorite wildflower spots, and posting the resulting shots on my facebook page. I’ll be trying to shoot every day, because as we’ve seen over the past week…things change quickly, and the season is fleeting. Hope to see you out there! 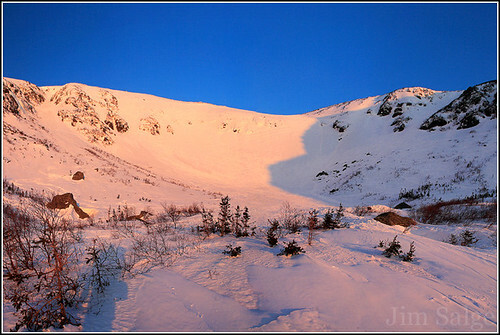 Earlier this week, I put out a call on facebook for a 3AM start on a hike into Tuckerman Ravine…Why 3AM? Well, the ravine is one of the most popular places to be in New Hampshire on an April weekend, and I value solitude on my photography adventures. Camping was out of the question, as there would be hundreds of others at the shelter, so hiking through the night was the only way to get the sunrise shot I needed. Fortunately, a few others had the same ideals. Hiking at night offers many benefits. The air is cooler, the snow is firmer, and snowshoes are rarely necessary. And a special consideration for this specific location this past weekend, with a forecast of a pleasant bluebird during the height of the spring skiing season…there was no issue with parking! We were a group of four, two with great experience hiking at night, two first timers, both to night hiking, and to Tuckerman Ravine. All were photographers, hoping to capture an iconic snowscape at it’s peak, right before the first busy weekend. The trail was ideal for the uninitiated…it’s wide, and essentially groomed, and we made great time. At Hojos, we spread out, each finding our own vision of the morning, found what we came for, and witnesses a glorious light show in a special place. It was our own…solitude in a place few find it. The solitude allows you time to process what you are privileged to observe. The sun rises North of the Carters this time of year, illuminating only half the bowl at first light. The other half is is cast in a great, charismatic shadow from the Lion Head on the northern rim of the glacial cirque. The shadow begins long, and recedes into the increasing brightness of the day. Color changes rapidly as well, from pink to orange to white. Cool blue tones bring color to the shadows. By 8AM, we had captured what we had come for…but for many the experience was about to begin. 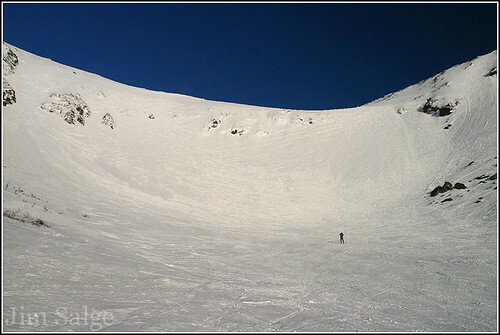 On the way out, we met about 1500 strange glances from skiers, climbers and hikers going the other way. Some asked our motives…and we joked that the snow was gone, or that we were off to sell our parking spots. A few likely understood that we were just there, hiking our own hike…just like them. We hear all the descriptions on the news. Spring snow is heavy, spring snow is wet, spring snow is miserable, and it should be gone. I would like to remind the media that spring snow is beautiful. And fleeting. This morning, every tree branch supported thousands of crystals. The landscape was white for one last time, but signs of spring abounded. The rivers were free of ice, the robins were singing, and a few crocuses were poking through the snowpack. 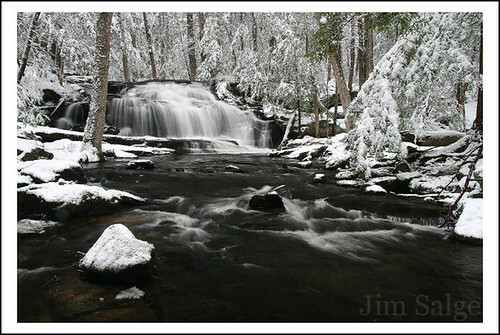 There are very few times in a winter that you can shoot waterfalls and snow simultaneously. 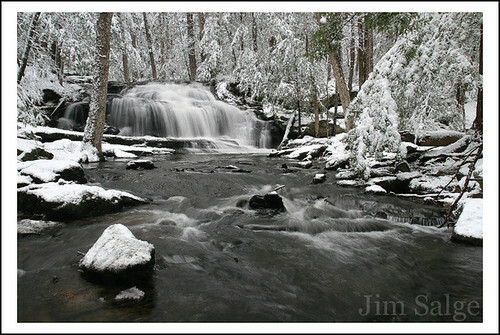 Most of the winter in New England, the falls are choked with ice…but spring snow changes the game. I had my eye on a little ledge called Tucker Brook Falls in Milford for a few years for just this type of spring storm, and was out the door early yesterday morning hoping the snow would hang in the trees until I got there. It did. Just barely. As I got there, the wind was picking up, the snow was letting off, and the temperatures were rising above the critical mark. Snowbombs from the trees ruined every other shot, either by hitting my camera, or falling in front of it. I soaked through two terry cloth towels trying to make it work. Fortunately some shots did. I spent a good part of the time yesterday experimenting with the my polarizing filter. This filter is one that can’t be reproduced digitally, and really adds to the pre-production value of digital photography. It’s good at taking glare off of water, which was in abundance yesterday. As an artist, I had to choose between a dark stream, or a light stream…as each conveyed a different mood. I was quite struck by the difference a 90 degree spin of the filter made to the shot. As an example, here are two pictures … one is completely un-polarized, the other fully. Ultimately, I felt that leaning towards more polarized fit the spring mood better, but I left some glare in for both of my final shots. Spring often brings some of the greatest contrasts between valley and summit of any point during the year. This past weekend provided a perfect example of almost unimaginable incongruity, for while valley temperatures climbed into the forties under clear skies, the summit of Mount Washington was enshrouded in a blizzard, with temperatures below zero and winds at times over 90 mph. 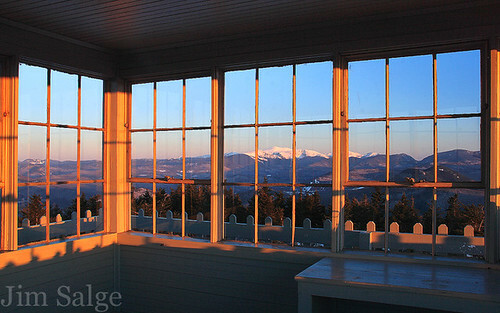 As a former meteorologist and weather observer at the Mount Washington Observatory, the mountain is more than oft on my mind, it’s in my blood. As a nature photographer, the peak has been a focus of much of my artistic pursuit, and this past weekend, I was set to lead an EduTrip on photography at the summit station. These trips provide provide participants a unique opportunity to ride up on the snowcat and spend a night at the top of the mountain, and to experience all the power that the mountain can unleash up close. Preparations for the trip began almost a year ago, when I selected the last winter trip of the season to hedge against brutal cold temperatures, and allow the group to spend more time engaging in the landscape. But the mountain had other plans! 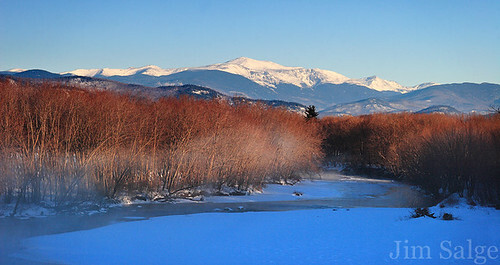 Eighteen inches of snow had fallen during the week prior, all under relatively light winds by the mountain’s standards. Now all that snow was on the move, creating a ground blizzard on the upper slopes. We put on an optimistic front to the group as we boarded the snowcat and began to ascend the road. The first four miles were easy travel. Snow fell lightly while the sun peaked in and out of racing clouds above. When we reached treeline, and the conditions instantly changed as the operator put the blade down to flatten out the drifts covering the road. The next mile took an hour as conditions worsened, and as we turned onto a point in the road known as Cragway, we knew the odds of making it to the summit would be slim. 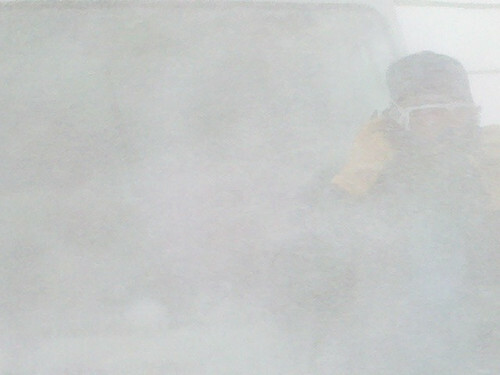 Coupled with 50mph winds now pointed at the windshield moving absurd amounts of snow down the mountain…and the decision to put safety first and turn around came easy. But we didn’t leave without allowing the participants to truly experience the rational for the decision. They all were impressed by the power of the mountain as they stepped out of the cat into a vacant landscape. I dared not take my good camera out of the bag, and the first picture my cell phone snapped was just a blank white canvas, undoubtedly aimed away from the intended subject by a large gust. This was the second and only other shot, from atop a fourteen foot drift looking down towards the snowcat a mere ten feet away. Sometime in the early 1600’s, Johannes Kepler discovered that planetary motion is actually elliptical, and that planets and moons go through an annual cycle of perigee and apogee in their transits. When the moon goes through perigee every year, it grows by as much as (gasp) 12% from its most distant point from the Earth. This year though, with the moon full at perfect perigee, the news cycle caught onto the ‘Super Moon’ phenomena as if Kepler never existed. 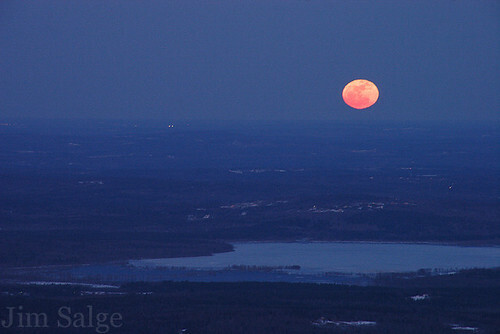 And, for many folks suffering from Nature Deficit Disorder, it was a good thing, for last night the Super Full Moon rose through a thin layer of haze on an otherwise clear horizon, and the entire New England region, in unison, tweeted about the beautiful orange orb in the eastern sky. As a nature photographer, I try to get out and shoot every full moon, as it is the only time of the lunar cycle that the moon rises at sunset, creating great photo-ops. And I thought I was going to hit the conditions jackpot this week to finally get my sunrise shot from Mount Adams/Mount Madison over the Great Gulf. I’d been after the shot for years, but my schedule and the weather’s schedule rarely lined up. As the weekend grew closer though, my luck faded as the cold front slowed. Temps forecast below zero, and winds that were slow to slow would keep me off the ridge at dawn. Plan B. Kearsarge North Firetower. Lower, sheltered, and a gorgeous 360 degree view…a more pleasant experience for stationary shooting. Morning dawned clear and quiet, as the moon slipped back over the Whites to the west. 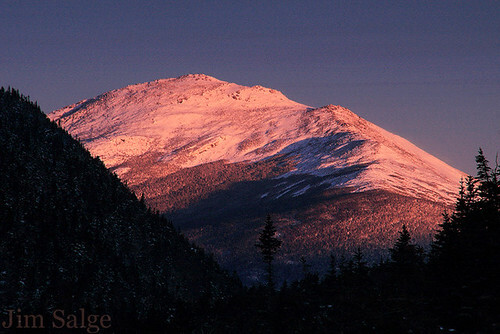 The alpenglow provided at a minimum some mental warmth, and some great scenes to the north as Mount Washington lit up. A experience in the mountains, on a night that so many were reminded of the beauty of the night sky and the natural world! I just returned from wandering around the mountains for a few days on my February break from school, and have a few posts to work through over the next few days. The conditions were never impressively dramatic, but I managed a few shots for the portfolio, and got a chance to work on my resolution to shoot more midday light. The most exciting aspect of the trip wasn’t a shot, but instead a new opportunity for a grand-view landscape shot in North Conway. Many of you likely know the spot, heading north before you descend the last hill about a mile from the outlets, there’s a pull-off next to the Saco River. 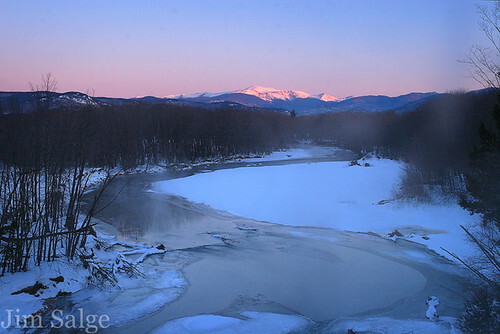 The view opens up over the river to the Moat Range, and on a clear day Mount Washington is centered over the river as it bends into the trees. I’ve seen some fantastic shots from here, but none newer than 10 years ago, as the trees on the bank have grown substantially into the view. Still, I’ve tried to make it work. I kept thinking in a good snow year, the banks would be high enough to shoot over the trees. Wednesday morning I realized that nothing short of a bucket truck would do. I looked behind me as I grew discouraged and realized that there was construction at the end of the pull-off, low and behold, they cleared a view! I spent well over an hour exploring every angle of the new view, as the light changed from soft pink to harsh blue. 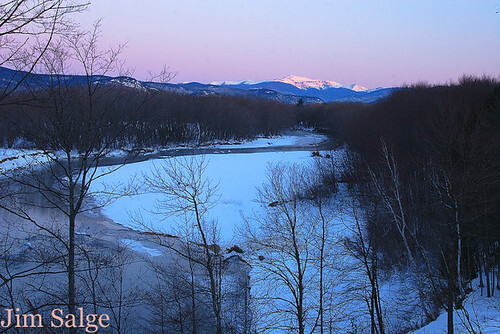 The vantage has amazing potential, as the river curves and sweeps and leads the eye up to the snow-capped mountains. Wide View from the New Vantage! Color…The middle ground is inherently dark here in winter, and you need a lot of reflection of early morning light off clouds to bathe the trees in a warm color. Add that to the water reflections, and a altocumulus sunrise would be a dream here. Cold: A frigid, below zero morning would likely line the shoreline trees with a hoarfrost, which would lighten up the middle ground substantially. Snowfall: A hanging snowfall would really balance the light in the shot…but it’s real tough to keep fresh snow in the trees and have Washington, which is in the clouds most of the winter anyway, in the clear. One of the first people I met when I began working in the White Mountains in 2003 was Mike Jones, who was then the Hutmaster at Lake of the Clouds Hut, which at the time was my closest neighbor. Mike has a passion for nature that rivals, if not exceeds mine, and I certainly looked up to him for his presence in the mountains. He has since focused his time on getting his doctorate in Biology, becoming the foremost authority on New England’s Wood Turtle population, and starting a non-profit organization dedicated to the study of Eastern Alpine terrain. We’ve kept in touch since, mainly through mutual admiration of adventures and experiences, and I was excited to learn that he was care-taking at Carter Notch this winter. 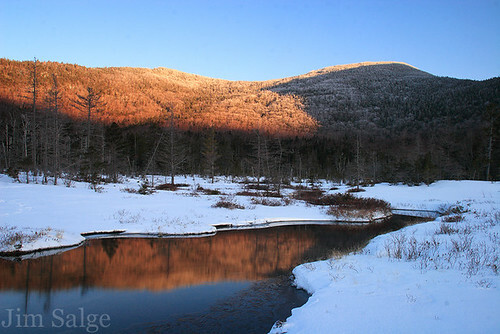 Last time he wintered over there, he studied the movements and motivations of one of the most rare and elusive mammals in the White Mountains, and I was hoping he would track a few down again. His encounters with Pine Marten this winter have proved nothing short of remarkable. I hiked up this past weekend to reconnect with Mike and his wife Liz, who I worked with in 2004. I didn’t see any marten, but did track them around through the woods and ramparts above the hut. It was my dream to see one, and better to capture one on film, but didn’t matter, as it was great to spend an overnight with good people, and great conversation in a special place. In the morning, I snuck out early, fruitlessly hoping to encounter a marten, and instead found Mount Madison glowing through the notch. Even without this shot, it would have been a great trip. And I’ll be back to chase the marten as long as Mike keeps posting pictures and experiences like this!